A high profile shop on the corner of Dawson Street and St Stephen's Green is available to let at €140,000 per annum through Finnegan Menton. The unit has been occupied by Elverys Rugby Store for the past 15 years and, prior to that, was an Aer Lingus ticketing shop. 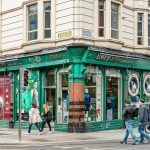 Elverys has outgrown the shop and recently opened a larger unit in the St Stephen's Green Shopping Centre. Number 13 St Stephen's Green has over 20 metres (65 ft) of street frontage and extends to 137.7 sq.m (1,482 sq.ft.) at ground and basement level. Currently the basement is used for storage but previously was used for retail. The façade is about to be refurbished, according to the agent, and this should enhance its visibility and attractiveness. This part of the city centre has benefitted from the introduction of the Luas Cross City service which passes in front of the shop. 13 St Stephen's Green has more than 20m of street frontage and extends to 137.7 sq.m. at ground and basement level.